Tonally, the AG660CEAR has the articulation a Grand Auditorium can offer with a little more emphasis on the trebles. Being made of acacia, the projection is nicely harnessed with a really quick response which produces a more focused projection and fewer overtones, making this guitar a great choice for recording and live work. 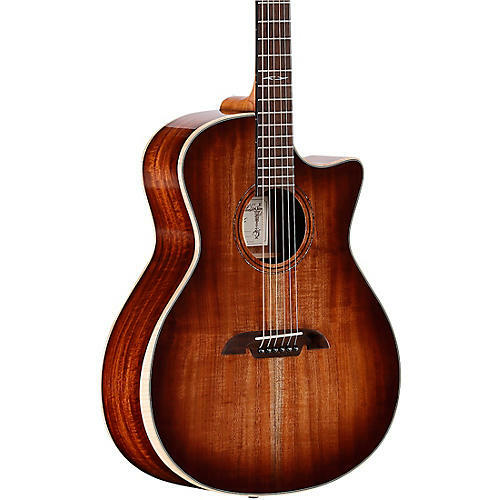 This 990 is fitted with the discrete but lively SYS100 pickup and preamp which is located in the end pin and controlled by a smartly designed soundhole console offering volume and tone controls. Overall, the AD990CEAR is a premium quality instrument offering amazing value, with a sophisticated voice and stunning aesthetic. developed, and the tone is impeccably crafted and married to a stable, consistent and lively sound box. Each model is designed to get the best out if its components, and for them to work together to produce balance, lively projection and great response. These components include Alvarez'a FST2 bracing system, bi-level rosewood bridge, real bone nut and saddle, great quality tonewoods and thin finish. FST2 is a forward shifted X brace design, this means the axis of the X is closer to the soundhole and therefore creates a larger soundboard area allowing for more energy and vibration to be harnessed. Both the X braces and asymmetric tone bars are carefully scalloped. The scalloping design was the result of years of continual development in their Yairi workshops. The Artist Series sound and personality is open and powerful. FST2 also creates very good balance so both the treble and bass registers are clearly present and balanced in relation to each other. Along with a more angled headstock, the Alvarez bi-level bridge increases string tension by making the break angel of the strings from the saddle to the top more acute. Improved string tension adds to their sound, feel and response, which are also heightened by the use of real bone nuts and saddles.